281 Volunteers are needed to make this event a great success and experience for the attendees. Youth Volunteer Restrictions: Volunteers must be 18 years of age or older without a supervising adult. Children, 12 and up are welcome to volunteer but must be accompanied (one-to-one) by an adult, 18 years of age or older. Parking: Limited parking available at the Elementary School prior to 7:15am. Shuttle Services will be provided from the Windcrest United Methodist Church at the corner of Midcrown and Walzem for those arriving after 7:30am. Event Description: The Fiesta Especial Regalia Run 5K & Parade, whether participants choose to compete in the Royalty Run 5K, walk in the 1-mile fun run or ride on a float in the parade. The route is lined in shade trees with pleasant views as the course wraps around the golf course. Participants are encouraged to kick back and relax after the run as a parade winds through the city streets featuring a colorful display of the sights and sounds of Fiesta®! The Parade that follows the run is comprised of disability service organizations and those they serve. These organizations are invited to participate at no cost with a float, walking, groups, cars or carts. This is one of the few 5K's in San Antonio where the runners and walkers get personal interaction with the individual's impacted by their participation on the day of the event. Runners, walkers and all the floats are lined up in the street together creating a very visible impression of why everyone is there. Program Description: Fiesta Especial® is an educational outreach program of disABILITYsa. Fiesta Especial® is also an official Fiesta® San Antonio experience created for children and adults with physical, cognitive and developmental difference and the family and friends who love them. 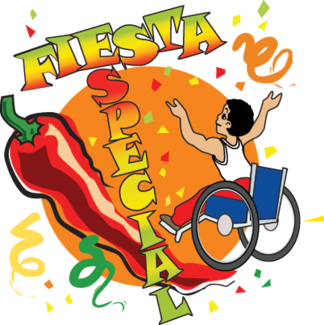 Fiesta Especial® creates inclusive and educational experiences engaging individuals with disabilities in the culture, diversity and celebrations of Fiesta® through community instruction and training. Individuals with disabilities and our community are invited to take part in the Royalty Court, 5K& Parade and Celebration day experiences. Fiesta Especial® programs are organized and hosted by disABILITYsa in partnership with Fiesta® San Antonio, The Fiesta® Carnival (Wade Shows) and the City of Windcrest. Proceeds from the Royalty Run 5K support charitable, non-profit programs but improve the lives od children and adults with disabilities in our local community throughout the year. Proceeds from the event will provide educational outreach, residential services, day program and recreational activities for children and adults with special needs. Volunteers will assist 5K & Parade committees in setting up the registration, games/ activities, merchandise, snacks, water stops, course, etc. to get ready for the race and parade. Bring a headlamp! Volunteers will assist the 5K Team in registering new runners/walkers, presenting packets to pre-registered runner/walkers, assigning chips to all registered runner/walkers, and ensure each runner/walker is submitted to data entry team. Volunteers will assist in the sale of Fiesta Especial merchandise. Volunteers will operate the games and activities for children attending the event. The games will be set-up in the City Hall Parking Lot. Activities will be assigned at Volunteer Registration. Two to three volunteers will be assigned to each station. Volunteers will assist with the First Aid/First Response for any medical emergency that might occur up until Ambulance, Fire, or PD can take over. REQUIRED: Volunteer must show proof of First Aid/CPR Certification. Volunteers will assist the Parade Team in decorating the convertible vehicles for the Fiesta Especial Royal Court members who will be riding at the front of the parade without damage the transporting vehicles. You may bring decorations with you. Volunteers will assist the parade captains in registering parade entries and getting them lined up in order along the street. Volunteers will assist the 5K Team in removing and returning the Timing Chips off of the runners and walkers in the 5K and 1 Mile events. Volunteers will direct and cheer on runners/walker along the course route. Shift ends with last runner/walker passing. Vehicle will drop-off and pick-up. Volunteers will prepare and distribute water to the runners and parade participants during the 5K, 1 Mile and Parade events. Volunteers will collect and pick -up as many cups as possible to keep the route tidy. Volunteers will collect snack vouchers from runners before distributing fruit/tacos/snacks to participating runners/walkers. Volunteers will be at the front of the parade carrying the banner. Volunteers will walk alongside the convertibles carrying the Fiesta Especial Royal Court. Two volunteers per vehicle, one on each side.